This is our utterly gorgeous Luthilaci Shrug! <br> <br> It's made gothy stretch lace and crushed velvet; the sleeves are gathered for an elegant, steampunky-victorian-alice effect... with pretty litle contrasting velvet and lace trim cuffs! The lace is only in Black, but the velvet can be in any of our normal shades. 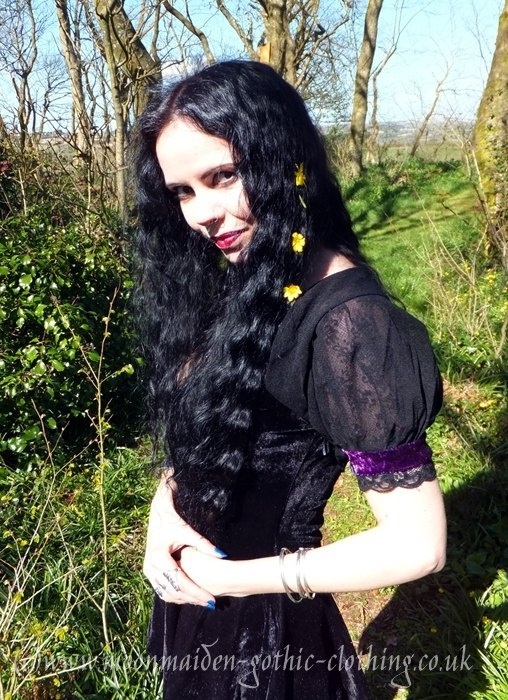 It's shown here in Black and Purple!<br> <br> It's a great bolero for really gothing-up any outfit, and is worn here with our Nymphalinae Crossover Minidress! This is our utterly gorgeous Luthilaci Shrug! It's made gothy stretch lace and crushed velvet; the sleeves are gathered for an elegant, steampunky-victorian-alice effect... with pretty litle contrasting velvet and lace trim cuffs! The lace is only in Black, but the velvet can be in any of our normal shades. It's shown here in Black and Purple! It's a great bolero for really gothing-up any outfit, and is worn here with our Nymphalinae Crossover Minidress!